While its liftoff was hidden by a dense blanket of fog draped over Cape Canaveral's Complex 36 Thursday morning, the last Lockheed Martin Atlas 3 rocket flew into the history books in fine style as it successfully launched two formation-flying spy satellites probably meant to track enemy ships at sea. As the countdown commenced Wednesday afternoon, an approaching weather system sparked pessimism that thick clouds and rain would all but certainly scrub the launch. Air Force meteorologists predicted a 95 percent chance of unacceptable conditions at the planned liftoff time. But the launch team moved forward with pre-flight activities, rolling back the protective gantry enclosing the 176-foot-tall Atlas 3B rocket atop pad 36B and loading super-cold propellants into its stages. As the night wore on, Mother Nature began to smile upon Cape Canaveral as the cloud cover and rain cleared. The 95 percent "no go" forecast changed to 70 percent and eventually no weather rules were threatened as the count entered its final phases. Not all would be ideal for the VIPs, news media and spectators watching the night owl ascent, however. Fog began developing over the Space Coast and quickly swallowed the pad from view. The launch team, seated inside the Complex 36 blockhouse located next to the pad, oversaw a smooth and uneventful countdown. With this last mission by Atlas 3 and the recent retirement of the Atlas 2 series of vehicles, this would be the final Atlas liftoff from the site after 43 years. As clocks ticked down, the 145th and farewell launch from Complex 36 was cleared for an on-time departure at 2:41 a.m. EST (0741 GMT), beating the weather odds and not hampered by the foggy conditions. Watching from 2.5 miles away at the Cape's famed Press Site 1, reporters and photographers saw not even a glow as the rocket's Russian-designed RD-180 engine blasted to life. After the powerplant's vital signs were checked in the last moments of the countdown, clamps fighting to keep the rocket Earthbound sprang back in an instant and the vehicle was free to fly. The chest-pounding roar of the rocket rushed across the quiet night, but there was still no Atlas to be seen in the wall of fog. Riding on nearly a million pounds of thrust, the vehicle raced upward and suddenly appeared above the fog bank about 20 seconds into flight with its flickering exhaust of golden flame morphing into a super-hot bluish tail. 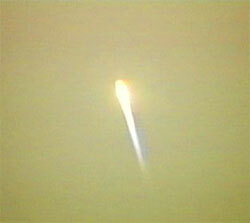 It was clear sailing after ascending above the fog as viewers could see the rocket for a couple of minutes. The rocket headed northeast, hugging the U.S. eastern seaboard on a unique trajectory. 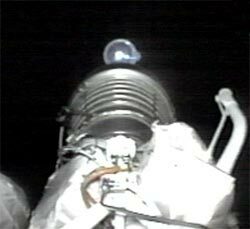 A rear-facing camera mounted on the vehicle captured crisp views of the spent first stage separating and disappearing into the night only to be illuminated a few seconds later as the Centaur upper stage ignited its main engine. 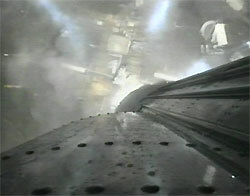 One half of the rocket's jettisoned nose cone could be seen falling away, too. Nearly 18 minutes into flight as the vehicle flew just south of Greenland, the Centaur reached its initial orbit above Earth. The rocket coasted around the world for an hour before re-starting the hydrogen-fueled RL10 engine over the South Pacific to nudge its clandestine payload into the intended orbit. About 79 minutes after liftoff, Centaur successfully deployed its cargo into an orbital perch that flies as much as 63 degrees north and south of the equator. A short time later, sharp-eyed satellite-observing hobbyists in Canada spotted two satellites flying close to each other and the discard Centaur nearby. The sighting, coupled with the orbit achieved, left little doubt this was the third in a series of launches performed in the past three-and-a-half years that have placed satellite pairs into such a highly-inclined Earth orbit. This type of orbit was used by 11 spacecraft missions, each featuring a trio of small satellites flying in a triangular formation, launched between 1971 and 1996. They were believed to be part of a network commonly called the Naval Ocean Surveillance System, or NOSS. The more recent launches using Atlas 2AS rockets from Vandenberg Air Force Base, California, in September 2001 and December 2003 mirrored those earlier flights with one key difference. Observers watching the skies see only two satellites from each Atlas launch instead of three, suggesting a new generation and design for the NOSS system. The National Reconnaissance Office -- the secretive government agency responsible for designing and operating the U.S. fleet of spy satellites -- uses the NOSS spacecraft to keep tabs on ships around the globe, experts believe. The spacecraft are thought to be capable of detecting radio transmissions from ships to precisely pinpoint a vessel's location. Tracking suspicious ships in the war on terror is a critical purpose of the NOSS network, the experts say. For more on the goodbye to Complex 36, see our separate story.